Ericsson is showing off a prototype of its Android-based IPTV Remote, which allows users to control TVs throughout their homes, as well as heating systems. The prototype has a 10-inch touchscreen, a forward-facing camera and speakers and could also be used as a mobile phone and to browse the Web, the Swedish company said Monday at Mobile World Congress. The camera can be used for video conferencing, displaying an image of the person being talked to on a regular TV, according to Leif Björklund, head of IPTV solutions at Ericsson's Multimedia business unit. The user interface on the IPTV Remote prototype can group content into clusters of icons, so movies or sports have their own groups. To start showing a program, the user drags and drops one of the icons to the top of the remote and it appears on the TV. The same can be done with music. 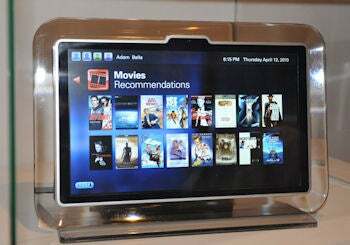 Besides being a remote, the device can be used as a TV by itself, and support for social networks can also be integrated. Ericsson chose to base the IPTV Remote on Android because of the operating system's openness and it has a community that can help develop the product, according to Björklund. Also, if Ericsson had picked Windows it would have had to spend much more time on securing the remote, Björklund said. Ericsson will start shipping IPTV Remote this year. However, it won't sell it in stores, instead Ericsson is looking for operators to sell the remote. One of the reasons Ericsson decided to demonstrate the IPTV Remote was so that it could generate some operator interest to get help with the final stages of the product development. In the end, the operators will decide what kind of services that should go on the device, according to Björklund.